We are rallying again with other gluten free food bloggers from around the world. Our topic this month: Brownies. Intensely chocolate, chewy and crackle-topped brownies. What is your favorite style? This recipe is adapted from one in Cook’s Illustrated magazine. Christopher Kimball contributed a number of recipes to my book (he is also top dog at America’s Test Kitchen) These brownies are intensely chocolate using baking chocolate and cocoa found in any grocery store but I like to enhance them by using Felchlin Cocoa and quality Guittard or Callebaut the chocolate leftover from my chocolate truffle making parties. When we rally, I weigh the ingredients so you can see the recipe in both Imperial and Metric measurements, sometimes I make changes to an original recipe as I experiment with other flours to add some nutrition into the baked good. 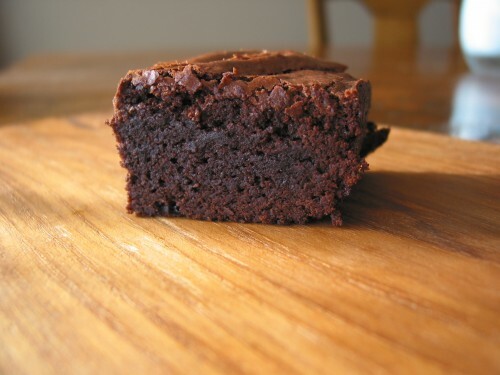 For brownies though I consider them 100% treat and the Multi-Blend mix has the right combination of starch using tapioca, potato and corn (they are all interchangeable for those who are sensitive to one or the other). The mix also includes sweet rice flour to smooth out the mouthfeel and brown rice flour for the nutrition. Everyone has developed their own standard GF flour mix these days (so they can call it their own) but don’t let that confuse you. Find the one that works best for your needs. 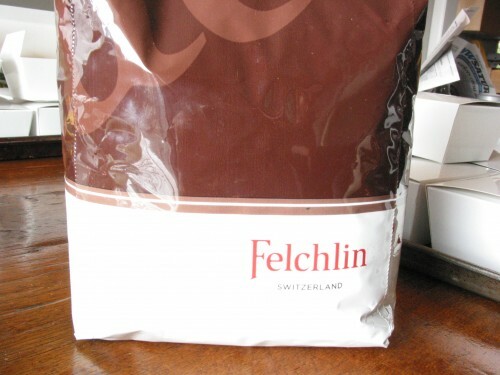 This one is adaptable and can be used with healthier flours for other baked goods so it means I need just one mix and some bags of sorghum, millet, and teff on hand for bread, pizza, or muffins. The raspberry pureé is a nice touch if you want to add an elegant touch for a dinner dessert. It is adapted from a recipe in one of the original Ark Restaurant cookbooks. The Ark was a fantastic restaurant on the Long Beach pennisula in Washington state years ago. It was a frequent James Beard award winning restaurant in its day. We would make the trek to Long Beach for our anniversary from time to time. We loved the Ark Restaurant but sometimes we missed the mark choosing where to stay. I will never forget the time we rented a place in the area and after receiving our room keys we discovered the fireplace did not work, dog hair was literally everywhere (and we are tolerant pet owners ourselves), and there was some other problem with the room. Our visit was in September. We brought the owner in to show him our troubles and he said “oh, we haven’t yet done our deep cleaning since the summer” !!!! After we declined to stay there we had a good laugh about how crazy we were to expect basic vacuuming and cleaning prior to our arrival. I wonder if he survived the economy? Ha! 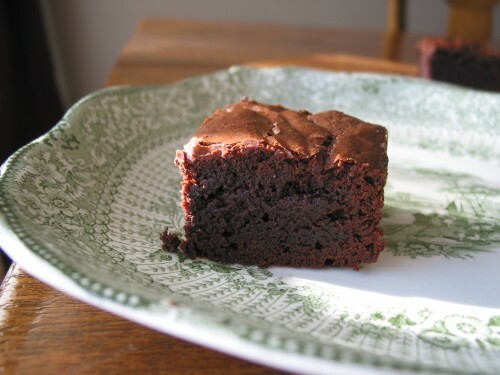 Might I tempt you with a brownie? On day two they are more chewy—day one, a bit more cakelike. Preheat oven to 350ºF. Butter an 8-inch square glass baking dish. Line the bottom with parchment and then butter the parchment. Melt butter and chocolate in the top of a double boiler, stirring occasionally until smooth. Remove from heat, whisk in cocoa powder, and let cool slightly. In a medium bowl, whisk together eggs, sugar, vanilla, and salt until thoroughly blended. Whisk in warm chocolate mixture then stir in flour mixed with guar gum until just combined. Pour ½ of the batter into the prepared baking dish and sprinkle chocolate chips evenly over the top. Pour the last ½ of the batter over the top of the chips, covering completely and scraping the bowl well. Bake for 35-40 minutes, or until a toothpick comes out clean with a few crumbs clinging to it. Set the dish on a wire rack until cool enough to handle. 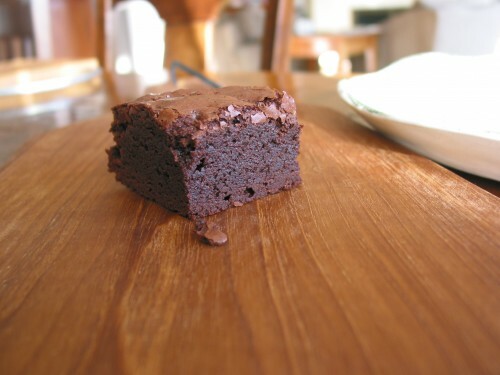 When completely cool, place brownie sheet on a cutting board. Using a thin, sharp knife, cut into 16 squares, wiping the knife between cuts to ensure smooth, clean edges. 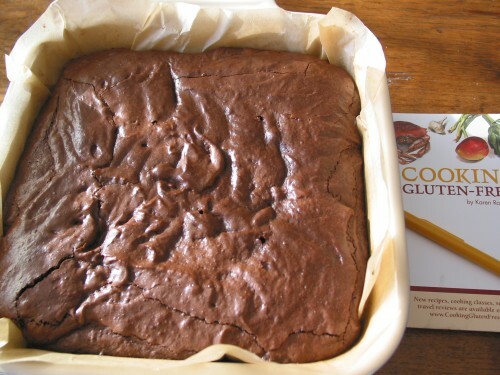 Brownies can be frozen in individual serving sizes; wrap each tightly in plastic wrap, then seal in a large freezer bag. Bring raspberries, sugar, and water to a boil in a nonreactive saucepan, stirring occasionally. Remove from heat. Stir in lemon juice. Puree in a blender. Strain through a sieve, pushing on the solids and discarding the seeds. Adjust quantity of sugar or lemon juice if necessary. How about enjoying the heavenly slice of this Raspberry brownie with a scoop of vanilla ice cream or the flavored one of your choice? Moreover, if the scoop is added as a topping to the brownie, you can dig this with the help of a spoon and place the whole-hearted piece into your mouth and melt it right away. This dessert may nearly cost you 0.75$ if taken from the coffee shop.